If you have trouble getting your children to order food, a restaurant in Matthews, NC may be your salvation. MATTHEWS, N.C. — If you have trouble getting your children to order food at a restaurant, a pizza parlor in Matthews, NC may have your salvation. Mama's Pizza and Pasta has decoded kid language into menu items. 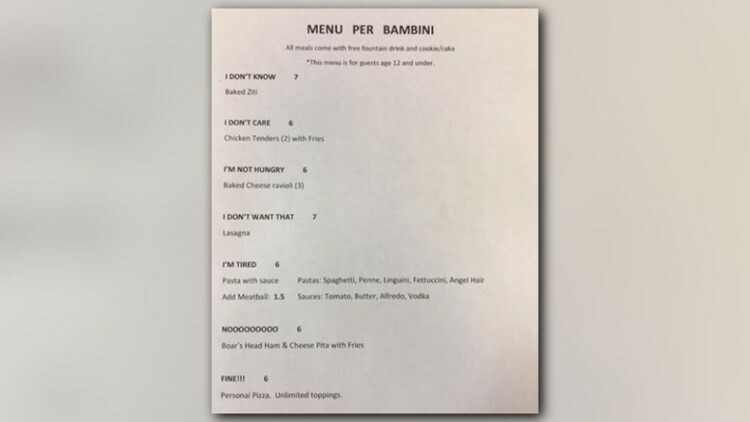 "Menu Per Bambini" lists seven entrees and their corresponding titles. All the meals come with a soft drink and cookie or cake, and guests must be age 12 and under. The restaurant just started a kids-eat-free night on Wednesdays.